looks this cute dragon corner bookmark! P4 B - Happy Saint George's Day! P4 celebrate this great day making roses to bring home. Saint George is a very nice topic to work on. We made shields, played games , did theatre and sang a song. We have been talking about animals that life in different places...the jungle, the sea, the farm... they like all them! To have extra fun, check the following song!!! This week we have started a new topic, "My body and Clothes". It's an opportunity to revise a topic we introduced last year. 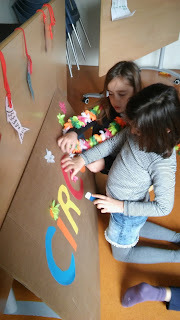 The idea is that they are able to use as many words as they can and have a goog knowledge of the parts of his/her body in English. 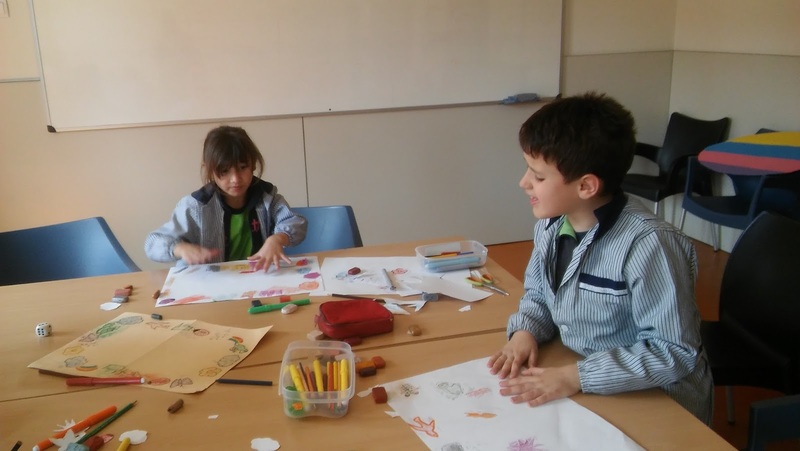 We work throught different ways, from memory games and games to drawing a mural. We will keep you informed of how it goes very soon and some pictures will be added, too. 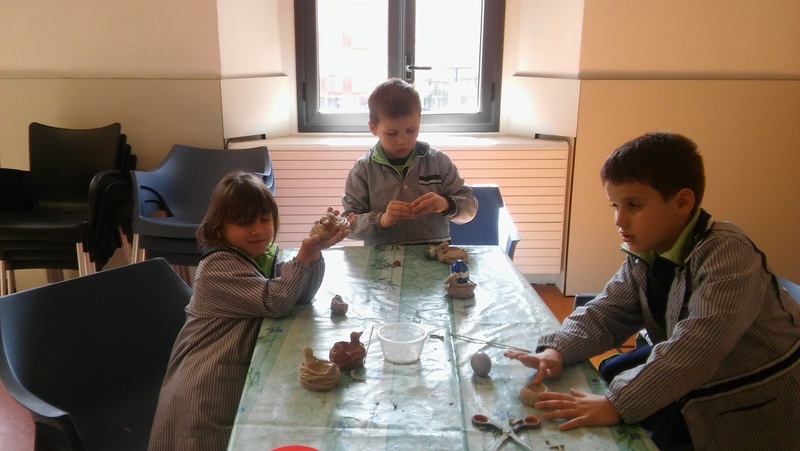 After having made clay figures and learnt more about Circus, we decided to plan something completely different and easier to do. Children love cartoons of "Les Tres Bessones". That's why we chose an episode of this three twins and a wolf, called White Fang" in Alaska. It was a more enjoyable and relaxing session. It was great! 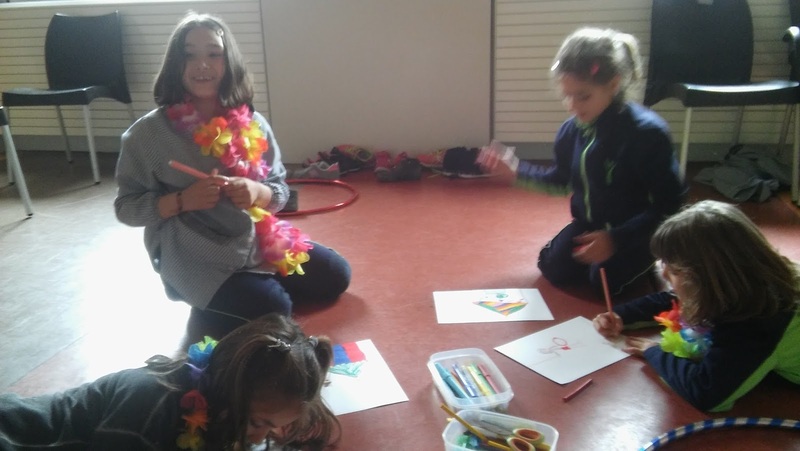 1st grade: Circus and dices! A few weeks ago we spent two sessions in Circus topic. From the main acrobats, trapezists and jugglers to the main animals and their performances. We did so by playing memory games with flashcards and by making a dice. 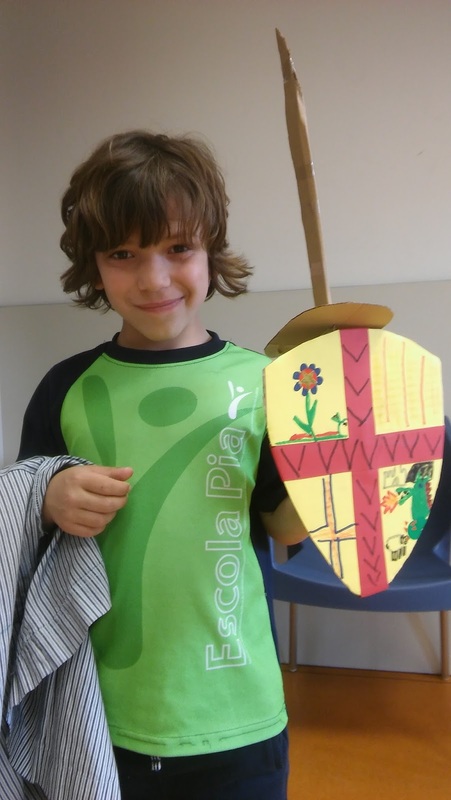 This week we have decided to prepare something really special for Saint George. We have in mind the idea of playing Saint George's tale in a modern version. Each of us will play a role but in a modern way. So, instead of the princess, the knight and the dragon, there will be hula hoop dancers, a juggler and some modern warriors. Here you can see some pictures. Enjoy it! This week we have focused on "I would like..." structures through fun games related to Saint George's Day and its vocabulary. 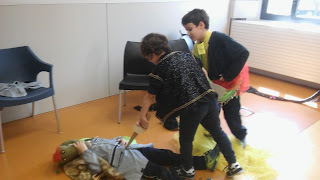 The students have learnt the main words about such traditional tale (princess, knight, dragon...) and they have practised them in conditional tense by making sentences with "I would like..." structure. We have enjoyed it so much! P.D: The next post is about how we prepare our costumes for Saint George's day theatre. After having made Slime, we focused on a topic entirely different: British humour. The fact that on 1st April is the day on which April fool's day is celebrated in the UK gave us the idea of introducing the students to British humour. Not only for learning new vocabulary, but to understand how humour and language are closely connected. As what is funny in English might not be so in Catalan and vice versa. The project was splitted in two sessions. The first one started watching an amusing video of Mr Bean, the famous British humorist and actor, entitled "Mr Bean goes to the cinema". Moreover, the video focused on the usage of Present Progressive by asking questions. The group did a great job, and understood the video completely. After that, we did a word search to discover new words (verbs, nouns and adjectives) and their context. 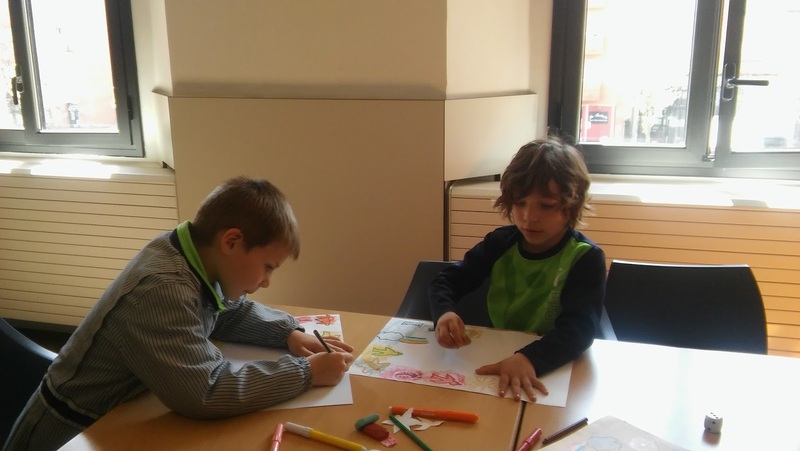 The second session focused on giving examples of short British jokes, most of them about animals through an activity of British Council for kids website. I must say that some of the jokes were not funny for the students, though. This was, however, a good point to discuss to during the second half of the class, as humour and culture are closely related to. Finally, they had to explain a funny joke in front of the class, either in pairs or individually. In doing so, they were aware of how difficult that was. 6th grade - Making Slime! 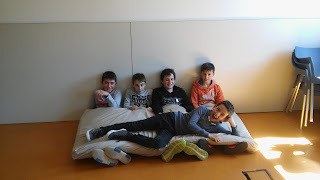 This month, April,6th grade has started very different activities in English. The firs one that I want to talk you about is "Making Slime". Most of students wished to do a more informal activity in English. We discussed around what to do (in English, of course), reached an agreement, made a list of all the ingredients needed and finally we went for it! Here you can see some pictures taken at class as well as copy of the list of ingredients we used. Two pots, two spatulas (or spoons). Unfortunately, our recipe did not work as we expected. Next time we do it, we'll get it, for sure! 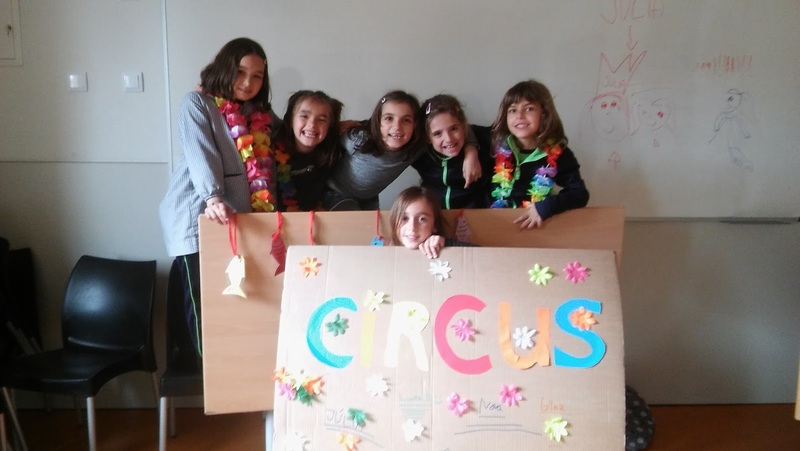 After an Easter break we continued with the Circus project. The girls spent a lot of time preparing beautiful decorations. It took some time to agree with eachoter ...but we are getting there. 5th grade Keep on running and speaking !!! These 5th graders have a lot of energy. Often we use games with a lot of movement . And after a lot of speaking and running it was time for a chill out. Time to rest !!! Guess who is the new student. Welcome !!!! First grade : Spring is in the air !!!!!! Hello everybody, spring is in ther air ! So we did a lot of activities around this topic. Before Easter we made a bird nest, painted real eggs and did an egghunt. After Easter we continued with the topic Spring. We made a boardgame with the folowing words: butterfly, ladybird, grass, flower , rainbow , bird , cloud, rabbit and frog. We played with domino game as well. We had to find flashcards in the park . 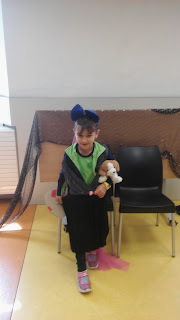 We used sentences like ; Where is the ladybird ?....and when the student found the ladybird ; ¨I found the ladybird !! !¨ Then we had to find the next picture according to the picture shown on the domino card. We had a lot of fun !!!! 2nd C - Weather + Food... what a combination! The group is working on an surprising mix of topics... The Weather and Food! but, how? 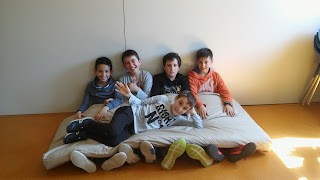 They have read the book "Cloudy with a risk of meatballs" and now they are watching the movie with same name (inspired by the book). Besides the vocabulary, they are looking for similarities and differences between the two stories. P5 B - Happy Easter!